SnapCacklePop: When Pete had night with Belinda Carlisle..! When Pete had night with Belinda Carlisle..! Everyone has a music icon! That person who you'd do anything to meet, have all their records and makes you go weak at the knee's. For some of us at SCP its Kylie Minogue and couldn't believe when we met her recently, however for our writer Pete its Belinda Carlisle. So when she hit our shores this week and took to the stage in Sydney, who better to write up her show than our Pete..! You know that feeling of excitement you get when you see your music idol perform live for the first time.. The person you've followed and know everything about.. You had their posters up on your wall as a kid and you wore out the cassette tape (for those older than 30!) listening to their albums over and over again.. Well Belinda Carlisle is that artist for me and for the first time I got to see her, just her. And it was AWESOME!! I first saw Belinda as a 16 year old when she came to Sydney for a record signing at Virgin Records in the city. She was signing copies of her Greatest Hits and I got special permission to leave boarding school and travel into the city to meet her. I queued for ages with my best friend, thinking of what I would say to her. What smart and insightful comments would I say to the lady whose poster adorns my wall? What did I end up saying? Gushing like a 13 year old girl at a Justin Bieber concert I said "OH MY GOD I LOVE YOU, IM YOUR BIGGEST FAN, I LOVE YOU" Yep. I was an idiot. Belinda, smiling politely said "that's nice", signed my photo and I moved on, feeling like I had the word LOSER burnt into my forehead! The next time I got to see her was at a 'Here and Now' concert in Sydney featuring an array of 80's & 90's artists including Kim Wilde, Paul Young, 1927, Human League, Go West & more. I was seated a long way away but I did get to tick one thing off my bucket list - I heard Belinda perform my favourite song - Summer Rain, live! She was fantastic but my night was not brilliant due to Paul Young's awful performance and my seats waaaaay in the back. Last night however my Belinda dreams came true. She performed an intimate gig at a nightclub in Coogee and it was quite obvious that many of her die-hard fans were there. She performed all her biggest hits and even treated us to a few surprises too! Not only did she perform some of her Go-Go's classics she also gave us a NEW SONG!!! Yes, her new single is called Sun - it got the crowd going and it will be released shortly - you'll know about it here on SCP when we have details but I did sneak a recording of the song - please excuse the 'live' aspect but you heard it on SCP first......!!! Overall Belinda's concert was nothing more than brilliant - everyone had a great time and Belinda gave the crowd exactly what they wanted. 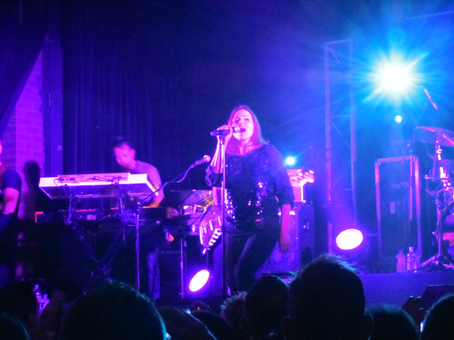 She loves her Australian fans and it shows from the great time she has had here and the Facebook comments on her page Belinda Carlisle Official whilst she's been touring here. There's no doubt that I will again be front and centre the next time she comes to Sydney! Thanks for an awesome concert Belinda..! And here is why we at SCP & Pete love BC so much...!